Children, teachers and parents marched through Cambridge today on April Fools’ Day to protest against “foolish funding cuts” to local schools. Protestors, from around ten schools in the area, marched from Reality Checkpoint to the Guildhall, where speeches were held demanding more money for education from central and local government. Chanting “save our schools” and “stop the cuts”, the protestors present numbered over 1000, according to the FundOurSchools campaign. Children accompanied with shouts of: “don’t take us for fools! We deserve a properly funded education”. The march was organised after the headteacher of St Matthew’s Primary School, Tony Davies, announced that the school’s funding was being cut by £60,000 next year – “the equivalent of two teachers”. The group of parents and carers at St Matthew’s who led the march, addressed an open letter to Cambridge academics in the Cambridge Independent, asking for their support. 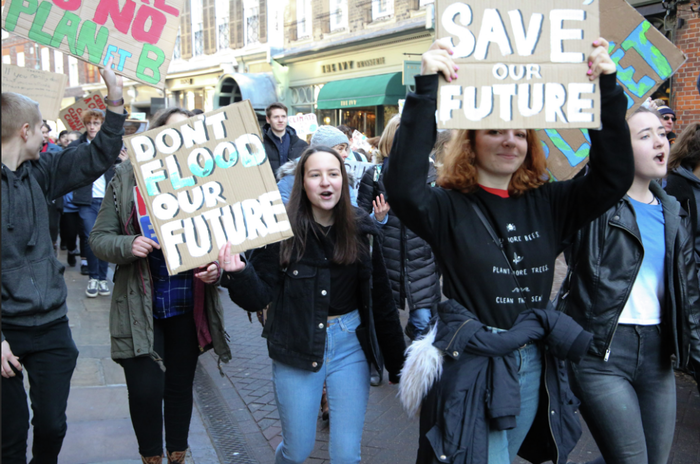 Citing the “dramatic reductions in funding” and subsequent “unprecedented pressure” on schools in Cambridge, the march organisers highlighted that “some schools in Cambridge [are] facing a reduction close to £200,000”. Addressing the crowd, Davies declared that “our politicians cannot get away with cutting our school funding”. Discussing their message to the government, a protestor told Cambridgeshire Live: “the message has got to be very clear [...] stop telling us you’ve upped the funding when you’ve actually cut it”. March organisers emphasised how “they are facing financial crisis” after having suffered a real terms funding cut of eight per cent since 2010, according to the Institute of Fiscal Studies. Cambridgeshire is one of the worst-funded education authorities in England, according to figures from Cambridgeshire County Council. The county receives £400 less per child than the average funded authority; in comparison to Westminster, Cambridgeshire receives £1,600 less per child. According to the National Education Union, schools in Cambridgeshire have lost out on £44.4 million in funding due to government cuts to per pupil funding since 2015. Schools are “struggling” to offer disadvantaged children and those with special educational needs and disabilities “the support they need”, the organisers continued. They added: “this has a knock on effect – not only on staff morale and teaching workloads – but on all children in the class”. Councillor Lewis Herbert, Leader of Cambridge City Council was at the protest. He told Varsity that the scale of the march “shows that our community is willing to fight back, and today’s march is only the start.” He also emphasised the need to protect nursery funding, which is “currently the only way for too many disadvantaged young children in Cambridgeshire to get the good start in life they need”. A statement from a Department for Education spokesperson noted that they recognised “budgeting challenges” and told ITV in a statement: “since 2017, we have given every local authority more money for every pupil in every school”. Citing staff costs as “the single biggest item of spending in schools,” they mentioned their new £508m Teachers’ Pay Grant across 2018-19 and 2019-20. The spokesperson further told ITV that “schools in Cambridgeshire will receive an increase of 3.5% per pupil in 2019-20, compared to 2017-18 funding levels, above the national average of 3.2%,” amounting to an “extra £20.1 million” when “rising pupil numbers” are taken into account. However, inflation averaged 2.7% for the 2017-18 academic year and in October the UK’s statistics watchdog complained that it was forced to write to the Department of Education four times during 2018 over “misrepresented” and “exaggerated” figures on school funding. Organisers questioned how the UK government can “expect the UK to remain a leader in the field of research, development and enterprise if it fails to properly invest in education at all levels”.